In Part I of the tour we looked at the entry hall, bunkbeds, living room and kitchen. Today I’m going to show you the bedroom and bathroom. Remember how tiny I said it was – just over 500 sq. ft. But don’t forget – it is on.the.beach. Here’s the floor plan again to refresh your memory. 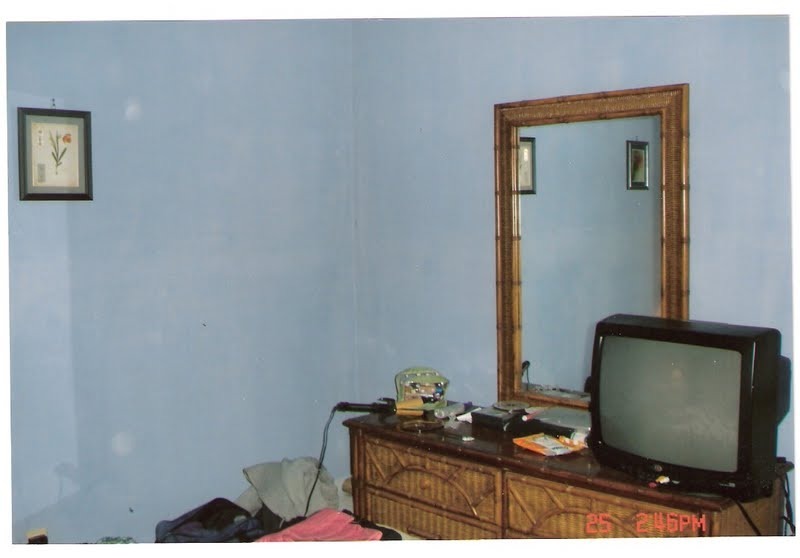 The bedroom and bathroom were just as disgustingly gross as the rest of the place. Dirty gross walls, nasty, icky, sticky, smelly carpet, old corroded door knobs. Ew, Ew, and more Ew!!! These rooms are so small that I couldn’t get a shot of more than one corner of the room at a time, so as you look at the pics just pretend that you’re standing in the middle of room looking around. Pookie had the idea that even though we were getting rid of all the furniture, we could keep the mattress temporarily and lay it on the floor to sleep on while we were renovating. Are you kidding me ??? Don’t you remember my reaction to the couch? 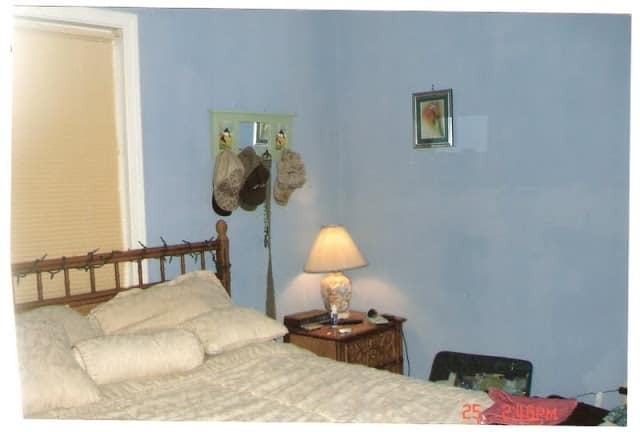 The before pics may just look like a case of bad decorating. You’re just going to have to trust me here. It was just as smelly and dirty as the rest of the place. I didn’t get too close to the bed in case I might brush up against it. EW. Same side of the room after. I’ll never forget the first night that I spent here. All of the furniture had been hauled out, including the mattress. We brought blow up mattresses to sleep on, thank you very much! Anyway, I don’t think I slept a wink that night. Not from excitement – but from being so afraid that my hand would slide off the mattress while I was sleeping and touch that nasty carpet!!!! Before. These doors were nastier than I can describe. I’m going to re-purpose them, so I brought them home to clean them up. Thought I was going to have to pull out a chisel to get all of the gunk off. Update: I did repurpose the doors in a totally unexpected way. Click HERE and HERE to see what I did with them. 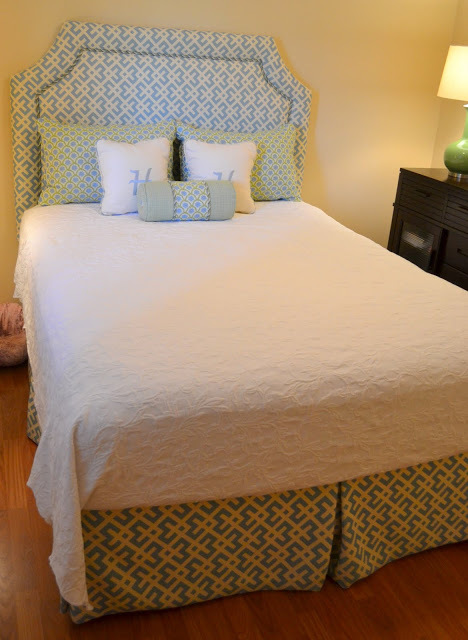 I made the boxpleated bedskirt out of the same fabric that the headboard is upholstered with. 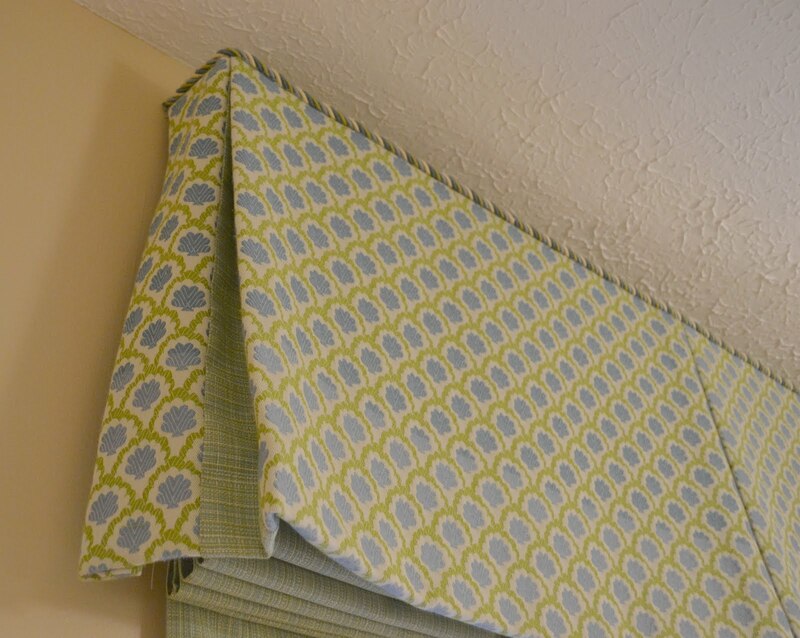 …and on the boxpleated valance. 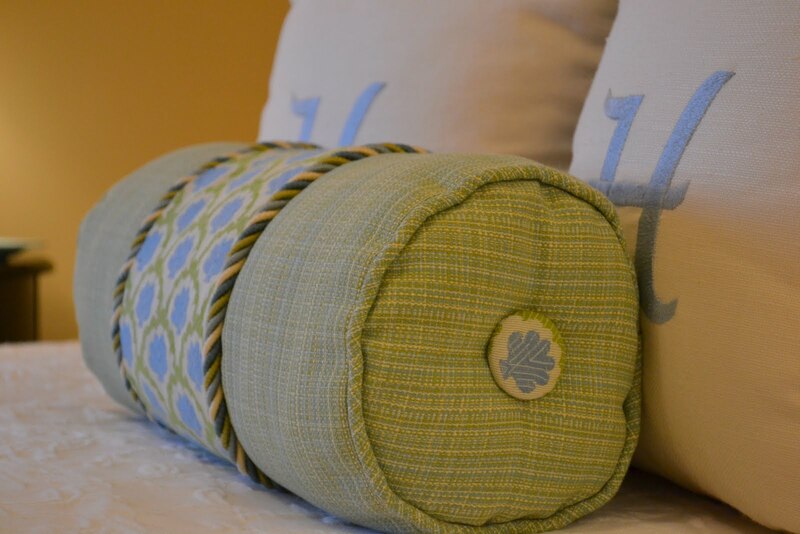 You can see that all of the fabrics are repeated in the pillow shams, the bolster pillow (don’t miss the cute little covered button! ), the valance and the blackout lined roman shade tucked up under the valance. Everything was made by me in my basement workroom. 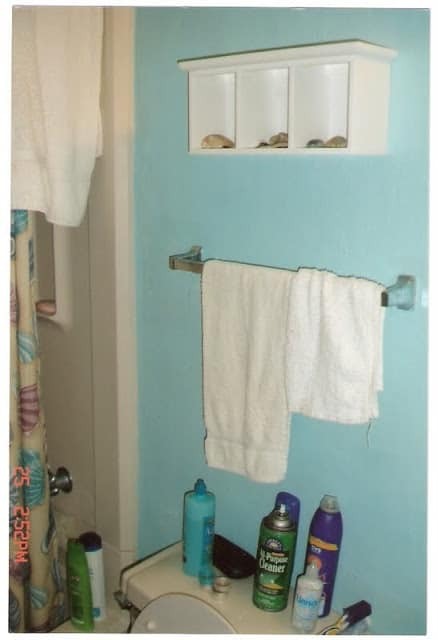 Now you get to see the bathroom. More grody EWness. Another room so small that you’ll just have to virtually turn your head to look around. Before. 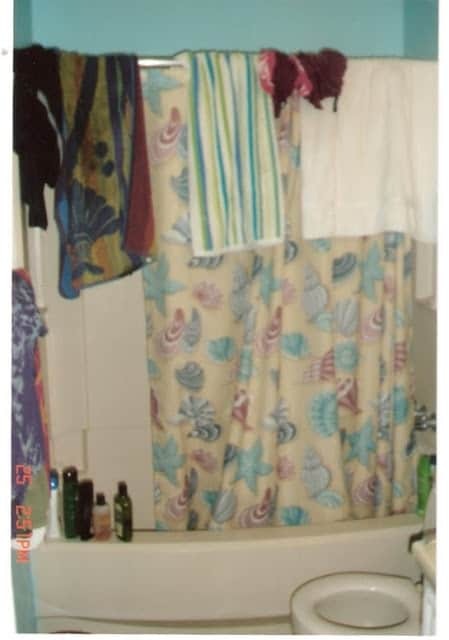 Look closely at the tub color – hint – it is NOT white. Sorry about the blurriness – these photos were all taken pre-blogging days. Just lovely. As much as I hated sleeping on the floor, imagine how I felt knowing I had to shower in here. Not good I tell you. 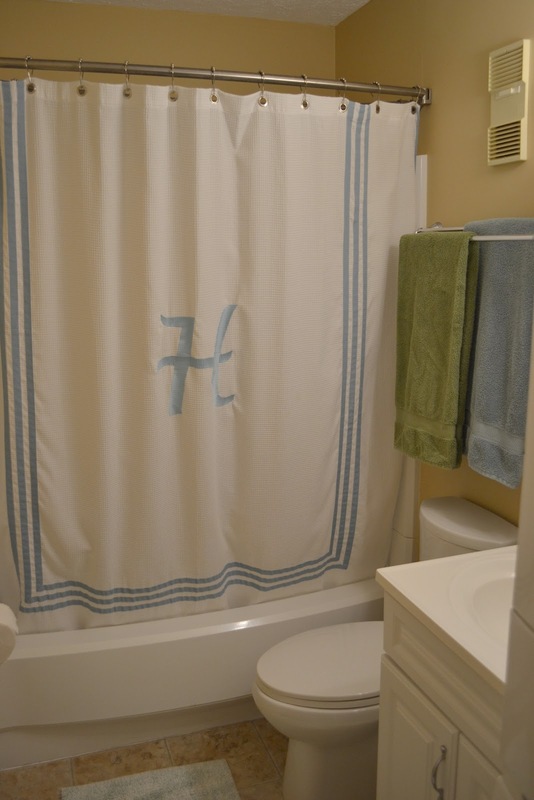 I found a ready-made shower curtain at HomeGoods and had a sweet friend add the giant “H” monogram. 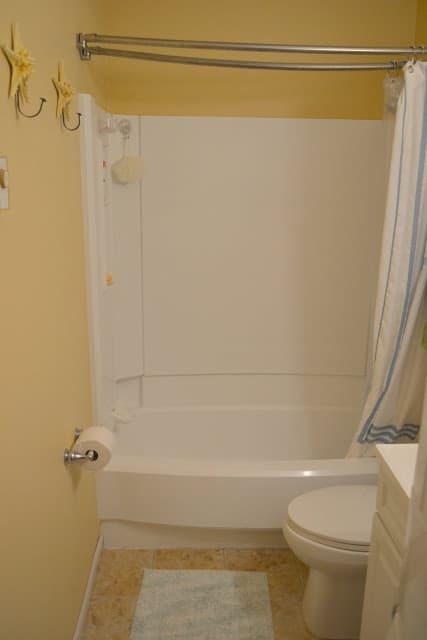 The reason that I wanted you to notice the color of the tub is because this is what it looks like now. Ahhh – now it’s nice and shiny and clean and white! Even though the tub/shower surround were filthy and a terrible dark off white color, they were structurally in good shape. So to save money we had a company called PermaCoat come in to resurface it. They did a great job and the resurfacing is holding up just fine. 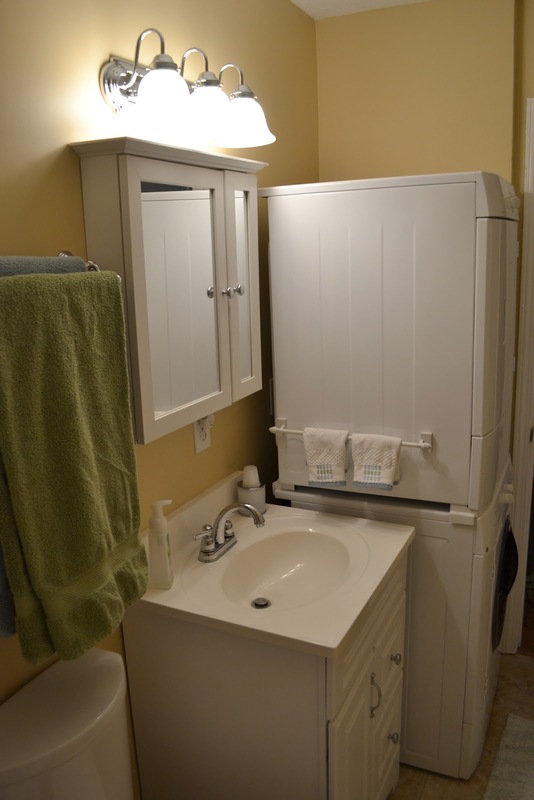 I’ll pull the view back and show you that we also installed a washer/dryer stack where a closet used to be. I wanted to have a washer/dryer here at the condo so I wasn’t hauling dirty linens home to wash.
Before sink and mirror. You should have seen this mirror in person. I can’t even describe it. Not pretty – it was a diy craft gone horribly wrong. 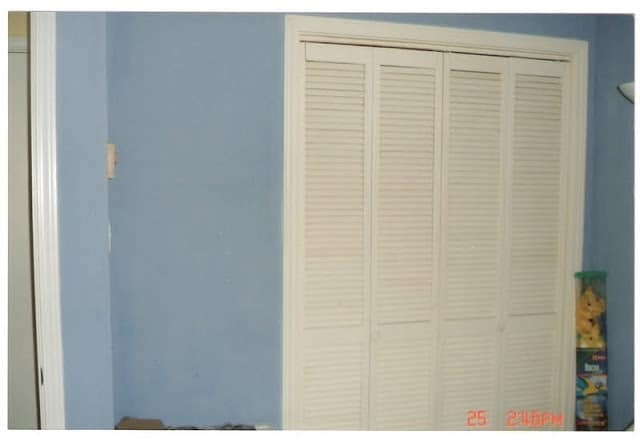 You can’t tell it in the photos, but in addition to the lovely cough cough dark aqua color that the room was painted, someone had tried their hand at a faux raised swirly pattern treatment on the walls. It was too much to sand off so we had to just replace all of the sheetrock in here. 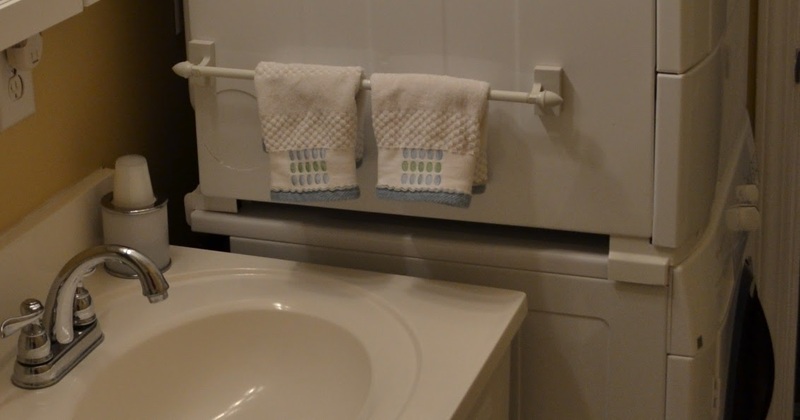 I didn’t have a convenient place to hang the hand towels, so I found this little magnetic curtain rod at Lowes and stuck it the side of the dryer. Update: Here is what the bathroom looks like today after installing a board and baton treatment on the wall and switching out the shower curtain and some of the linens. 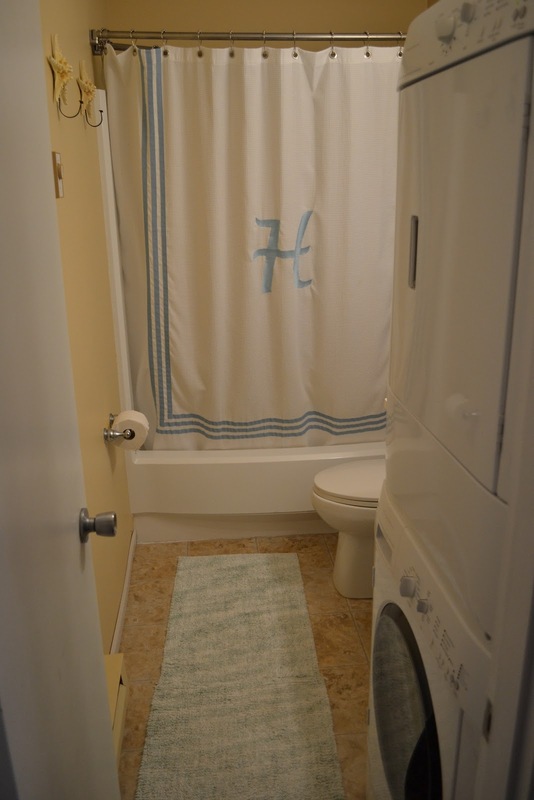 Click HERE to see more of the bathrooms new look. That finishes the tour folks. I hope you enjoyed it. It took us about four months to complete all of the renovations. We concentrated on getting it liveable during the renovation. It still looks a little plain to me, but I have plans y’all! Let me share this picture that I took from our deck when we were there a couple of weeks ago. Just by chance I captured the moon during the “blue hour”. This makes all of the work that it took to turn this condo into our dream home away from home worth it! Right now we are praying that Hurricane Irene takes a more eastward path, moving out to sea and not striking our beautiful beaches. Hi, I am your newest follower and so happy to meet you. Lovely condo. Hope you were spared by Irene. We lost a tree branch off our flowering pear tree and have lots of clean up to do today. LOVe your beach house. That headboard is a stunner, and the bathroom shower curtain is so pretty and coordinating. Thanks for sharing with my newbie party. Your beach house is gorgeous! I love the changes you’ve made. Your house is looking great, love the changes you’ve made! Your condo looks amazing, you did a great job transforming it. Wow! What a wonderful transformation! 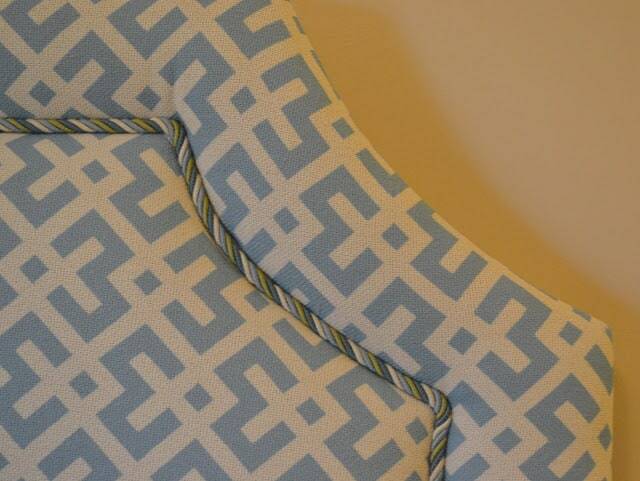 The headboard is very plush and chic, but I’m in love with the fabric! I want all your scraps to make a some little purses! 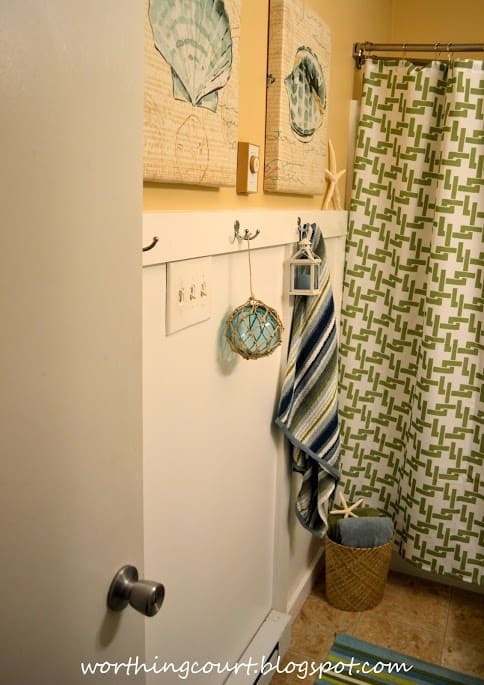 Thank you for sharing your beach house renos with us. You did such a beautiful job. I love it and especially love the colors and fabrics you used in the bedroom. Love your renovation,I too have a low threshold for EWW.Every thing looks so fresh and inviting.Now i’m off to learn from you how to make me a pillow sham(not much for sewing)oh and I must follow you on twtr. I love the fabrics used in this bedroom. Would you share the mfg. and patterns of these fabrics? Trish – Sadly, I don’t know the mfg. and pattern nos. of the fabrics. The fabric on the headboard was a closeout fabric purchased from Greenhouse Fabrics and is no longer available. The seashell print and green/blue mingled weave were purchased from a fabric store here in Greensboro called Printers Alley (they won’t share the mfg of the fabrics they sell). I do know that those two fabrics are still available as I saw them just the other day. They ship so here’s their phone no. if you’re interested: 336-272-4227. I would be happy to take a swatch of my fabrics there for you if they are unable to identify what you’re looking for over the phone. Just let me know if you need me to do that. Take care. What a beautiful makeover! My favorite parts are the fabrics you choose. The headboard and window treatments are stunning!! Found your condo makeover over at BNOTP. You did a fabulous job, I love the color palette you chose and all of the detailing. 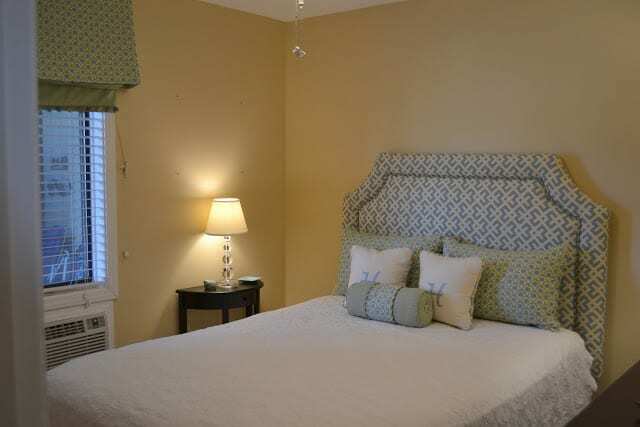 Bedroom is my favorite I think, so classic with a touch of soothing whimsy. Wonderful reno! Can you tell me where you had the headboard made or if you did it yourself and if so, is there a tutorial for that particular design with the cording? Love it! Found your blog through BNOTP..what a tranformation of a beach cottage..what beach town is it in? I can’t imagine a beach cottage that small..Hey, that’s one way not to have a lot of moochers! Do you plan to rent it out when you are not there? How far are you from the ocean front? Betty – You’re right – it is a tiny little place, but it comfortably sleeps six and we pack a lot of memories into it. Our condo is ocean front and sits just a few feet from the beach. 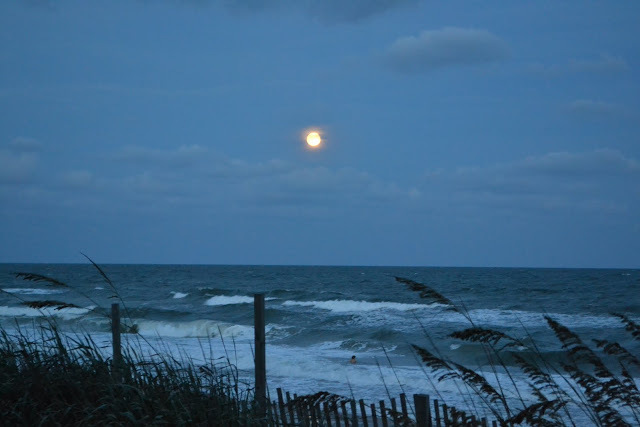 It’s located on one of the small family beaches between Wilmington and Jacksonville, NC. We’re down there so often that we don’t rent it out, but we do share it with family. Great questions! Wowza!! such a gorgeous condo! I love your beachy decor! Beautiful photos! I love the bedrooms. The wall colors and the side table seems so cozy. I have my new beach condo in Philippines and now I know exactly how I’d decorate it. 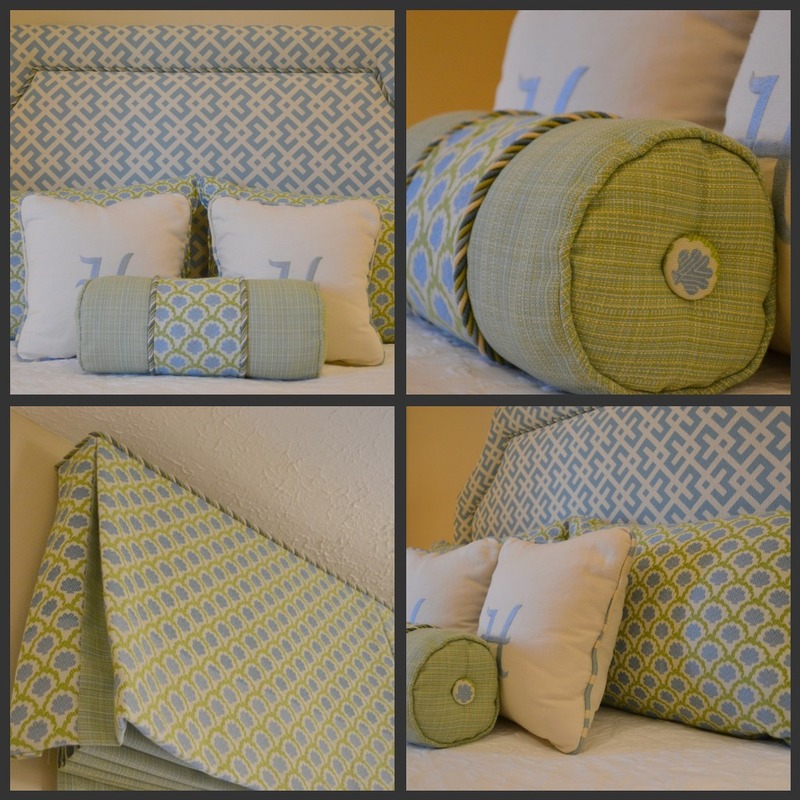 Love the fabrics you used in the bedroom. The whole condo looks so much better now! It’s wonderful! You did a very nice job with the renovation. 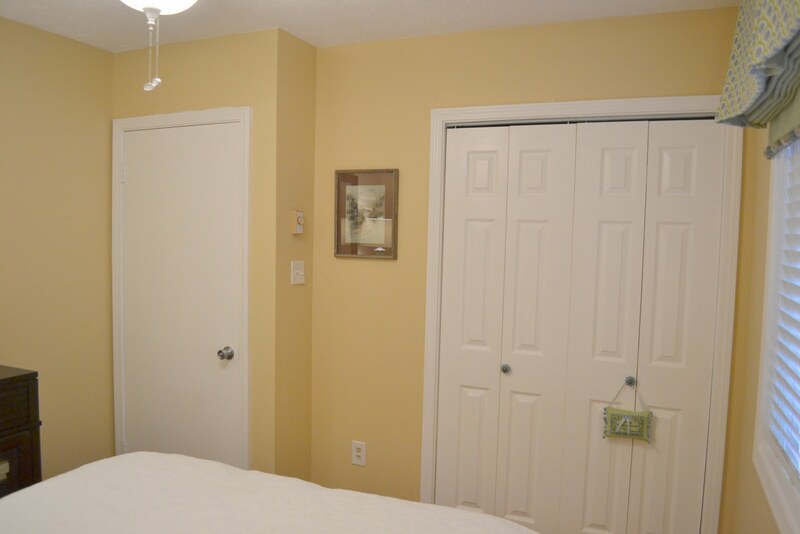 Good choice on the yellow paint, it made the room brighter and cozier. And what a beautiful view! That’s the best part of living in a beach house. I just saw this on Remodelaholic and I have to tell you the transformation is just amazing, you have done such a great job! this transformation is just fabulous!! i have just moved into a new house and looking for inspiration as my house is very bland right now, but i do hope that as time goes by it will improve so thank you very much for the inspiration, i have problems with color and love what you did with adding all the color to this beach house. OH MY! I just love how your new bathroom looks! On the other hand, I’m a bit sad that you have to repaint the whole room… Aquamarine’s my fave color. Well, it’s good that there’s a new look. It’s quite bothersome to see the same look every time, right? Suzy: Wow!!! What a complete and total transformation. I love your comment about being afraid your hand would touch the carpet as you lay on the air mattress! Isn’t it just amazing how people can live? I’ll never understand that…. Anyway, it’s gorgeous, and so inviting. Those lucky granddaughters.. and lucky you! 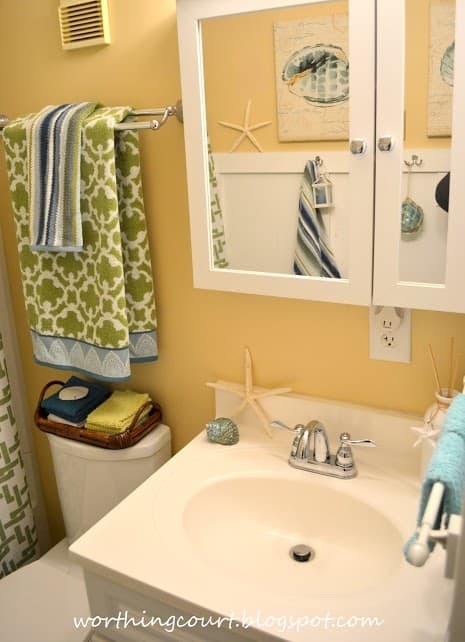 Great makeovers in the beach condo. I too love the beach. Your condo is beautiful. Thanks for making me laugh. 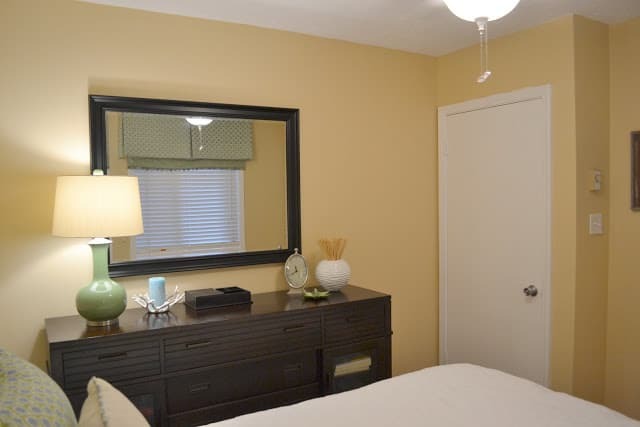 love, love, LOVE the yellow paint you used in the bedroom and bathroom. Are they the same?? It is the perfect shade of a creamy and softly muted buttery color without looking too tan, ochre or mustardy. I so hope you remember what make and color it is… I’ve been looking for ‘that’ color for my bedroom for at least 2 years now! Looking forward to seeing lots more great stuff on your blog!! Hi Susan. The paint is Lowes Valspar, 3004-10B, Holmes Cream. Sorry to see that you are selling your condo. It is still beautiful down here. Hi Jonsie. I know what you mean – it’s kind of sad. But – the hubs will be retiring before too long and we’re ready to do a little traveling. I’ll always love Topsail though!